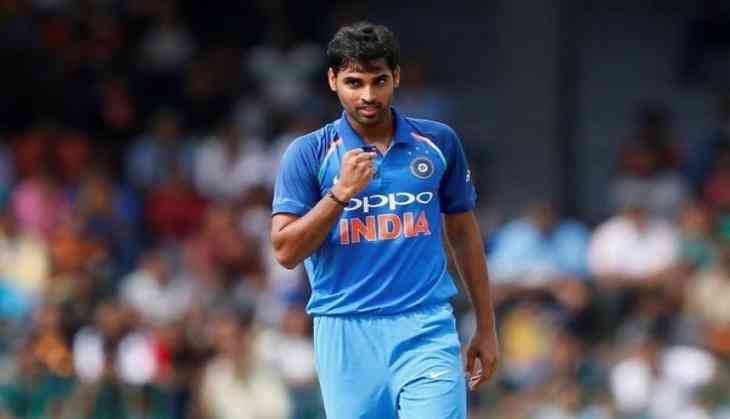 Indian bowlers, led by Bhuvneshwar Kumar held their nerves and helped India eke out a narrow seven-run win against a spirited South Africa and take the T20 series 2-1 at the Newlands here on Saturday. Needing 18 runs to win in the last over, South African batsmen Farhaan Behardien and debutant Christiaan Jonker were at the crease. They had plundered 51 runs in the last three and a half overs. But Bhuvneshwar, who had previous experiences in bowling crucial death overs, once again held the upper hand and gave away just nine runs, courtesy a boundary from Behardien. Jonker, who showed great promise during the innings and threatened to take the game away from India, got out in the last ball of the 20th over, making a quickfire 49 off 24 balls. Earlier, the Proteas won the toss for the third time and sent the visitors to bat first. Stand-in skipper Rohit Sharma, playing in place of regular skipper Virat Kohli, failed with the bat once again and made just 11 runs. Shikhar Dhawan (47) and Suresh Raina (43) then steadied the innings and shared a vital 75-run partnership, before the latter was caught at deep off spinner Tabraiz Shamsi. Thereafter, the visitors lost a cluster of wickets and huffed and puffed away to a respectable 172 for 7 in their allotted overs. For South Africa, pacers Junior Dala scalped 3 for 35, while Morris took 2 for 43. Shamsi finished with figures of 1 for 31. Chasing 173 runs to win the match and the series, the Proteas were off to a slow start. An in-form Reeza Hendricks was done by a knuckleball from Bhuvneshwar. Batsman David Miller started to find his touch with skipper J.P. Duminy at the other end. The asking rate was mounting at 12 runs an over when Heinrich Klassen departed for seven and South Africa were 79 for 3 after 12.5 overs. Duminy and Jonker then started accelerating and took on the Indian bowlers for a brief while. He hit gigantic back-to-back sixes against Axar. Duminy reached his fifty off 38 balls with a gorgeous cover drive and was going well before he top-edged a slower ball from pacer Shardul Thakur. Thereafter, Jonker and Behardien mounted some fight and almost took the Proteas to the finishing line, but Bhuvneshwar ensured that the visitors had the last laugh. For India, Bhuvneshwar was the pick of the bowlers, returning impressive figures of 2 for 24. Jasprit Bumrah, Thakur, Hardik Pandya and Raina took a wicket apiece. Raina was declared the Man of the Match, while Bhuvneshwar was adjudged the Man of the Series respectively. With this, India have won both the ODI and the T20 series after losing the Test series against South Africa. The Men in Blue will contest in the Nidahas Trophy, a tri-series tournament beginning from March 15 in Sri Lanka. The other two teams are Sri Lanka and Bangladesh. READ NEXT >> Are India’s poor being forcibly evicted because of Modi’s ‘Smart Cities’ project?